This three building complex curves along the brow of a hill. It overlooks Okanagan Lake and the vineyards of the Naramata Bench to the west. To the east lies the natural woodlands and hills of the Okanagan. The plan of the house and woodworking shop/garage form a concave curve, creating a sheltered courtyard that captures southern sun on the forest side. An artist’s studio is built into the hillside below the house. Its landscaped roof extends the existing garden grasslands. Wood is the main construction material for the buildings. Curved glulam beams fly through space following the dynamic lines of the architecture and highlighting a central circulation corridor/gallery. Above these beams, rafters are held in place by Douglas fir king posts. In section, the roof undulates; a living sculpture responding to the shape of the rolling hills, the hierarchy of spatial use and opportunities of sun, air and views. 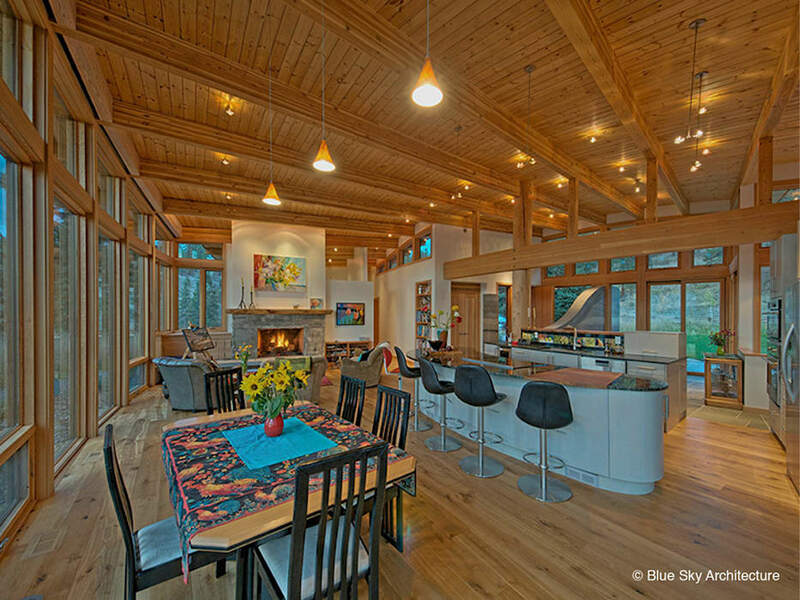 The exposed laminated Douglas fir frame and decking create beautiful, warm, sensuous spaces. All the timber frames were precut locally using CNC technology. Curved rammed earth walls run through the length of the buildings unifying the design and visually connecting the buildings to the desert land. The boundary between nature and the home is creatively blurred by the use of local wood, rammed earth and the sculptural forms. The architecture and art make profound connections between people and nature.